Ciancabilla, Giuseppe and Mario Mapelli. 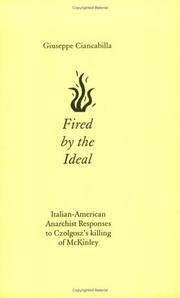 Fired by the ideal : Italian-American anarchist responses to Czolgosz’s killing of McKinley . Kate Sharpley Library: 2002. 28 pages. Translated by Paul Sharkey. We anarchists contend that the individual who stands highest on the social ladder and best embodies the political and economic oppression from which the labouring people suffers horribly, that individual is naturally the one most exposed to eruptions of rebellion from the oppressed and disinherited. In the calling of president, king, emperor, there are professional risks and work hazards; Includes an essay on Ciancabilla and list of Italian-American Anarchist groups. 9781873605080 $5.00/£2.00 Find at a local library.